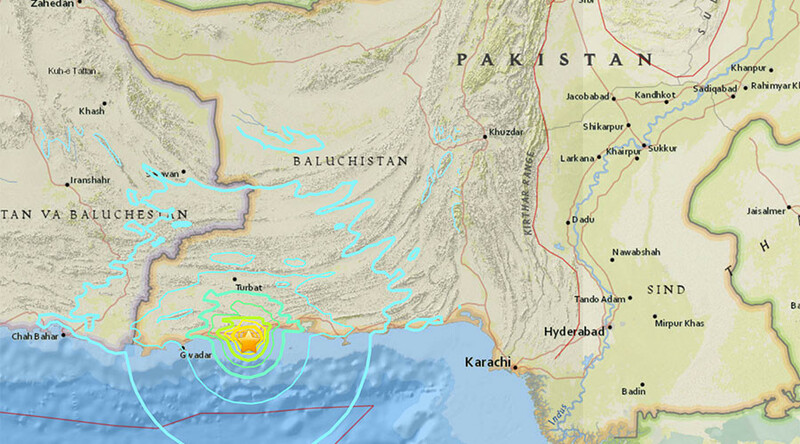 A powerful 6.3-magnitude earthquake has hit off the southern coast of Pakistan, the US Geological Survey reported. The quake, which was originally registered as magnitude 6.6, hit 23 kilometers southwest of the city of Pasni at a depth of 10 kilometers. The cities of Turbat and Gwadar are also within 90 kilometers from the epicenter of the quake. No reports of damage or casualties were immediately available in the aftermath of the quake. The Dawn quoted Commissioner of Makran Division Bashir Bangulzai as saying that no damage or casualties have been discovered upon inspection of the affected area. He noted that relief teams were dispatched to remote villages to make sure the locals are safe. Authorities in Gwadar also reported their city had suffered no damage as result of the quake, according to Deputy Commissioner Tufail Baloch. An inspection is under way in Pasni. The tremors have reportedly caused panic among residents in the Baluchistan province, where the cities and towns most affected by the quake are located. AFP reported that people residing near the quake’s epicenter poured out onto the streets. Pakistan is situated in a seismically active zone at a juncture of the Indian and the Eurasian tectonic plates that collide in the region, which often leaves its residents the victims of deadly earthquakes. One of the devastating quakes struck Pakistan-controlled part of Kashmir on October 8, 2005. The 7.6.-magnitude quake claimed lives of over 73,000 people and displaced millions. A heavy death toll was a result of an October 26, 2015 earthquake, that rocked South Asian countries, bringing most damage to Pakistan and Afghanistan. In Pakistan, almost 300 people lost their lives and over thousand were injured in the quake and subsequent aftershocks.